Your wedding is one of most important day of your life. 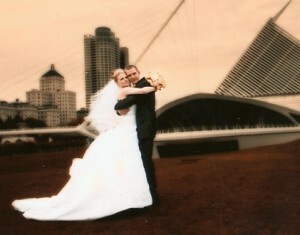 You spend alot of time planning and coordinating all the details of your wedding flows smoothly. Trust the professional wedding disc jockey at Party Rocker entertainment to work with from the beginning and help you turn your wedding dreams into reality. As a Professional Trained Master of ceremonies we will help control the progression of the evening by keeping your guests informed as to when the Bridal Party will be arriving When dinner is served . We will keep in touch with Photographer, Caterers and coordinator to make sure the night runs smoothly. We have Extensive Planning documents to help with all your song suggestions for First dance to Garter to Last Dance. You are trusting your DJ to entertain you & your guests on one of your biggest days of your life. Make sure your comfortable with them! Please contact us if you have any questions or to schedule a free consultation.